I really do not want to get disliked... or lets say, it is not my main aim. But this topic lays close to my heart. Long time I’ve struggled with vodka - especially its popularity! Though I have to admit: vodka has its advantages for some uses: First of all it is a neutral alcoholic base! Ok, you could say now, that this is one of the disadvantages and you’re right! But it depends... as base spirit in a cocktail, it is a disadvantage: no (pronounced) flavor and no character! However if you are producing your own cordials, liqueurs and infusions, it can be very useful! Second good treat is: drinking it neat! Yes: the good Russian or Polish way: chilled, neat, with some nibbles on the side (why not a bit of caviar?). You should order a 500 gram bottles (this is the traditional measure of vodka), and it supposed to be a traditional and decent brand - nothing too cheap, nothing too posh! Third: vodka has the purest attributes of gastronomic alcohol! One of these traits I really do appreciate: to enhance the flavor of its company. That doesn’t make sense if you are drinking a screwdriver, because orange juice has such strong aromas (acidity!) and the amount of juice in a long drink does the rest! But for a vodka martini it would make sense. But only if you have a good vermouth (what is about making your own vermouth? Soon I will pick up this topic - promised!). Also a Sake Martini makes sense: it is not easy to admit, but gin does not do the job in a Sake Martini Cocktail, because sake is too fragile and gin is too bold. In this cocktail Sake is the base ingredient and it should play the leading part. 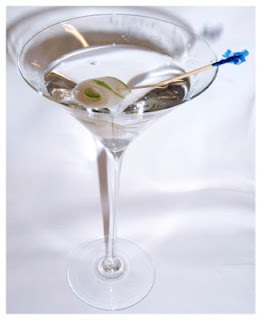 In this case vodka picks up all the delicate flavors of sake; equalizing the structure of the cocktail and amplifies the overall impression (very similar is the Smoky Martini which does the same with an Islay single malt, which is “diluted” and equalized by vodka)! The paradox is, that you really need to keep the sake part low - lets say 1cl on 5cl vodka! Good and clean vodka off course! Please also note, that we are substituting the vermouth with sake (not like other recipes, which are substituting the gin with sake)! Garnish: a roll of cucumber and pickled ginger. Preparation: Pour vodka and sake into a mixing glass filled with ice cubes. Stir properly and long till glass fogs up. Strain into a pre chilled cocktail glass. Cut a long thin slice lengthways of a cucumber. Cover with thin slices of pickled ginger. Roll the cucumber and ginger and fix with a cocktail pick and give it to the cocktail. So, ok, there are drinks, which makes sense with vodka - should we therefore "allow" vodka in mixing? I am not yet sure! One thing though we should consider: Vodka is not vodka! I mean there is on one side the odorless and flavorless beverage (which we need for the Sake Martini). And if we don’t use them any longer, I could live with it! On the other hand there are flavored vodkas. Traditional ones like Zubrovka, pepper or berry infused vodkas, which are already some centuries around (at least in Poland and Russia). The modern flavored ones, like fruit and herb vodkas. Even gin is a kind of flavored vodka (ok we should be fair: gin could be seen as halfway reunion of genever and vodka), flavored by an array of botanicals. First, I thought you could also live without a flavored vodka! However, it is an conceptional thing: if you are outlawing flavored vodka, you have to do the same with gin! Problem there! So I do not see a chance to substitute flavored spirits, including vodka!